The pistol league meets every Thursday night in the indoor pistol range from 6:00 to 8:00 pm. The main purpose of the pistol league is to develop skill and safety in precision target shooting and partake in supervised fun shooting. Our Pistol League recently held a “black-out” shoot using only flash lights. Everyone had a lot of fun! We also supervised a “Junior Pistol League for the Junior Rifle group. And by the way Clays … when are you going to have another “rat shoot”? For those unfamiliar with the term it’s shooting clay’s with your pistol using shot loads. Pistol League members swap tips and information on shooting, new products, reloading and whatever else comes up. 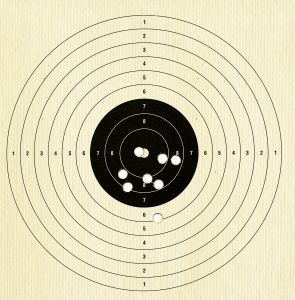 Bullseye shooting is a term used to describe shooting sport disciplines where the objective is to score points by hitting a round shooting target as close to the center as possible. A large emphasis is put on accuracy and precision through steady breath, sight picture and trigger control and fixed and relatively long time limits give competitors time to concentrate for a perfect shot. The CRGC Pistol League will be starting new sessions of the Winchester/NRA MARKSMANSHIP QUALIFICATION PROGRAM (Bullseye) in the Fall, Winter and Spring. Watch for Club eBlasts for dates. The “Bullseye” session is a 10 week course and is a skill development program as well as a good tool for new shooters. The bullseye course runs on Thursday nights from 6:00 to 8:00 pm. The location is the Indoor Pistol Range. The caliber is .22 rimfire. However, after the rim-fire course, we run a course for center fire handguns to accommodate those who do not have a .22 rim-fire or who wish to do both. Slow fire consists of firing 5 rounds and a second 5 rounds at will in 10 minutes. Timed fire consists of firing 5 rounds in 20 Sec. and then a second 5 rounds in 20 Sec. Rapid fire consists of firing 5 rounds in 10 Sec. and then a second 5 rounds in 20 Sec. Scores are tallied at the end. Join me at the Indoor Pistol Range. Indoor Pistol Range Qualification (IRQ) will be available.